It wasn't until the Maffuccis found themselves living on cups of coffee, and coffee alone, that they finally called a food pantry for help. The couple had sold their suburban New Jersey home where they had raised three children and set out to pursue the glossy dream of an easygoing retirement in sunny southwest Florida. But Mina and Angelo Maffucci quickly ran out of money -- overtaken by illness, bad luck and an economic crisis that claimed their Naples dream home to foreclosure. They soon found themselves staring at an empty cupboard. "You open up the closet and all we had was coffee," said Angelo Maffucci, 82, who had been a drywall installer in New Jersey. "I never thought we would be down on our hands and knees like that, but it happened fast." While the U.S. economy adds jobs and the financial markets steadily improve, a growing number of seniors are having trouble keeping food on the table. In 2013, 9.6 million Americans over the age of 60 -- or one of every six older men and women -- could not reliably buy or access food at least part of the year, according to an analysis from researchers at the University of Kentucky and the University of Illinois, using the most recent data available. The country was doing a "worse job in trying to end senior hunger in America," said Enid Borden, president of the National Foundation to End Senior Hunger in Alexandria, Va., which commissioned the report. She noted the number of seniors who "face the threat of hunger has gone up every single year since we started doing the research on this. And that's not good." Across the country, the rate of food insecurity -- the academic term for a disruption in the ability to maintain a basic, nutritious diet -- among seniors has more than doubled since 2001, according to the National Council on Aging. And it is projected to climb even further as the Baby Boom generation gets older. "It's a different generation," said Thomas Felke, an assistant professor of social work at Florida Gulf Coast University. The idea of relying on government benefits "may not be something that they admit to." And many seniors, who have perhaps never before navigated the sometimes complicated public services safety net, don't know where to look for help. They don't realize they qualify for assistance programs, including the Commodity Supplemental Food Program. 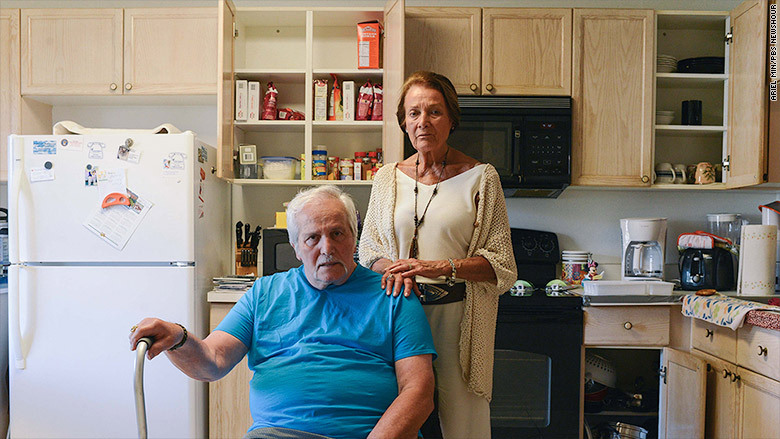 "If you're a single senior sitting in an apartment, you don't know what to do, you don't know where to go," said Al Brislain, president of Harry Chapin Food Bank in Fort Myers, Florida. When the discussions reveal deep embarrassment over a senior's plight, Brislain says he reassures older Americans "that they deserve this help, that it's neighbors helping neighbors, that it's the government supporting you in your time of need." In Naples, researchers using Census data have detected surprisingly high rates of poverty in gated communities. But following up door-to-door to follow up has proved challenging. "These gated communities don't want people coming around asking questions about poverty," said Felke. "It's really hard to find out who is hungry, who is struggling." With the help of a Naples food pantry and a weekly ration of $34 in food stamps, the Maffuccis' cupboards are no longer bare. But nor are they filled with nutritious food. Their diet still leans heavily on pasta and coffee. Angelo Maffucci's doctor advised him to eat more fish and vegetables to lose weight, but it can be a challenge. "Where you gonna get the money to buy the fish? Fish is expensive!" he said. "If you have it once a week, you're lucky." Kaiser Health News is a national health policy news service. It is an editorially independent program of the Henry J. Kaiser Family Foundation. This story was produced in collaboration with PBS Newshour.